We offer flexible leasing and installment plan models for business customers. For one boat or an entire fleet, we will gladly create an individual offer that meets your requirements. All leasing offers are subject to creditworthiness checks and availability. You concentrate on your business - and we’ll provide you maximum support with our full service offer: With this leasing model, you’ll always have the latest material and perfectly transparent costs at a minimum amount of effort. 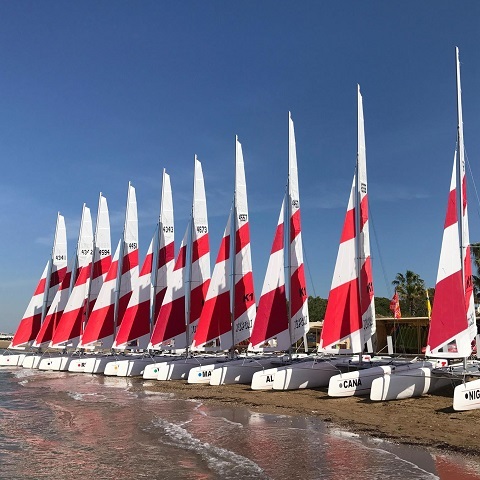 All inclusive: delivery, set-up, configuration, instruction, annual quality checks, assistance in creating a training system tailored to your sailing station, replacement wear parts, and pick-up at the end of the lease. At the start of the lease we’ll bring the boats, assist in the set-up, and provide thorough instruction. If something goes wrong during the season, we guarantee replacement within a very short time. Typical wear parts are included. At the beginning of each season we’ll stop by, give the boats a thorough check and replace wear and tear parts so you can start the season with material in perfect condition. After three years we’ll remove the boats and replace them with new ones. Before the boats reach an age where more and more things can start to break, we’ll have already replaced them. After all, TOPCAT Premium Leasing means always having the latest material. 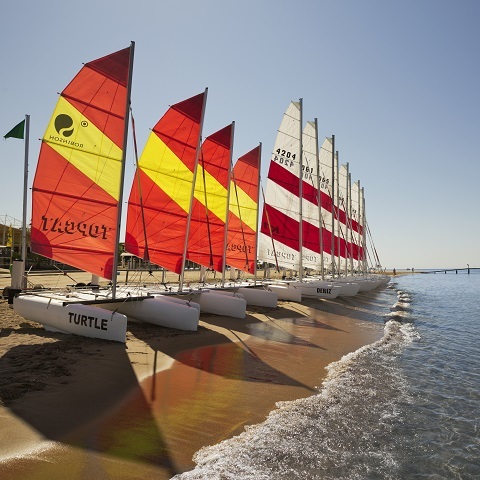 The classic lease: We lease new TOPCAT catamarans in the sailing school configuration and you have a fleet that’s always up-to-date. A transparent annual leasing rate makes financial planning easy for you and keeps you liquid. The very latest material ensures maximum customer loyalty. After three or four years, no need to spend a lot of time placing ads or making repairs, just return the boats to us and get new ones. The cheapest way to get into the cat business. Ideal for trying out whether cat sailing even works at your spot. We lease you well-maintained used boats at reasonable rates. At the end of 1-2 seasons, we’ll discuss with you how the cat sailing is going and what the next step might be. Decide now for a new TOPCAT and expand your fleet. With the full payment you can calmly wait some time thanks to our attractive financing models. The new boat generates revenue and you can finance it step by step. We understand that you often have revenue only in the season, so you pay the installments for your boat only in the season. In winter the rates are reduced to a minimum. To provide a large saling station with our boats, we are happy to combine several of our financing and leasing models. This gives you the optimal mix of attractice conditions and a modern flexible fleet. Please contact us to learn more about our flexible solutions for business customers.